Patients with Alzheimer’s disease are often identified and managed in primary care, where they may present diagnostic and management challenges. The benefits of early investigation and diagnosis of Alzheimer’s disease include instigation of pharmacological symptomatic treatments and initiation of psychosocial support, plus treatment of comorbid conditions. Here we review the diagnosis and medical management of Alzheimer’s disease, relying where possible on evidence from randomised controlled trials. What is the relation between normal ageing and Alzheimer’s disease? What is the benefit of identifying mild cognitive impairment? Longitudinal studies suggest that cognitive impairments in this early stage may remain relatively constant for several years.w3 This phase corresponds to the clinical concept of mild cognitive impairment, in which the individual has subjective symptoms (predominantly of memory loss) and measurable cognitive deficits but without notable impairment in defined activities of everyday life (box 1). Controversy surrounds the concept of mild cognitive impairment: is it really an identifiable precursor ripe for preventive interventions, or is it merely medicalising normal ageing? The debate continues, but prospective studies have shown that people with amnestic mild cognitive impairment (the form characterised by memory loss) are up to 15 times more likely to have developed dementia at follow-up,w4 suggesting it may be a precursor to Alzheimer’s disease . How does Alzheimer’s disease present? How do we diagnose and assess Alzheimer’s disease? For cognitive screening in general practice, the clock test is popular because of its non-confrontational nature and because the normal drawing of a clock more or less excludes the presence of important cognitive impairment. However, the rules for scoring the tests can be quite complex and using a solitary cognitive test to screen for the presence of a dementia syndrome does not do justice to the wide variety of symptoms that make up the clinical syndrome of dementia. Activities of daily living are assessed alongside cognition, but there is less consistency in the assessment instruments used. What is the cause of Alzheimer’s disease? 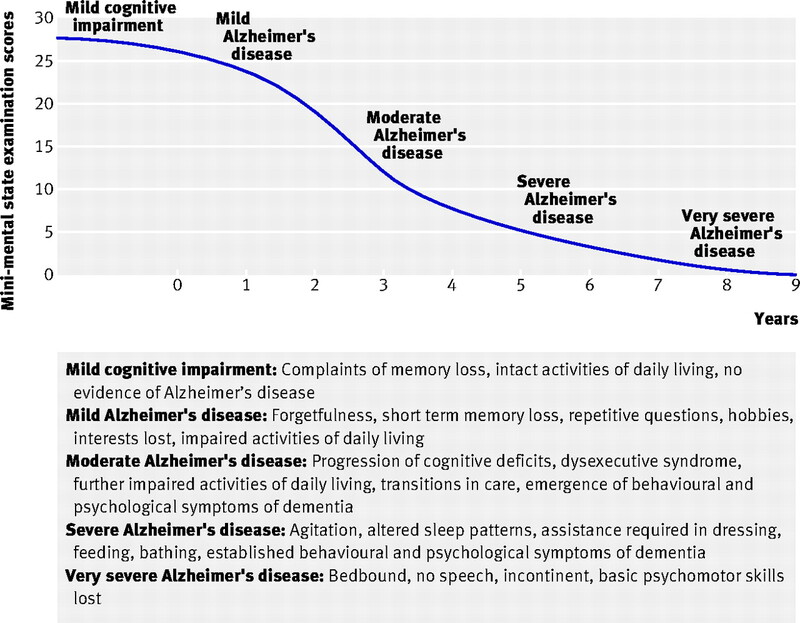 The cause of Alzheimer’s disease is unknown, but case-control studies have linked several risk factors with the disease including age, family history, apolipoprotein (Apo) E4 status, head injury, depression, hypertension, diabetes, high cholesterol, atrial fibrillation, presence of cerebral emboli, and low physical and cognitive activity (box 2). Some risk factors are potentially modifiable. What is the genetic contribution to Alzheimer’s disease? Mutations have been described in three genes: the amyloid precursor protein, presenilin 1, and presenilin 2, on chromosomes 21, 14, and 1 respectively. For late onset Alzheimer’s disease, the only known genetic risk factor is ApoE, located on chromosome 19. Three gene forms exist (ApoE e2, ApoE e3, and ApoE e4), with possession of one e4 allele being associated with a threefold risk for the development of Alzheimer’s disease, whereas those with the homozygous condition have an eightfold risk.w16 The importance of environmental factors is confirmed by the fact that the strongest association is not true across all races and 50% of white patients with Alzheimer’s disease do not carry an e4 allele. What treatments work for Alzheimer’s disease? Although we focus here on treatments for Alzheimer’s disease, many psychosocial interventions are appropriate for the clinical syndrome of dementia regardless of its cause. As most psychosocial interventions and some drug treatments are for symptomatic benefit they do not rely for their efficacy on modifying the underlying pathophysiology. For example, the treatment of depression in dementia is essentially the same whether the dementia results from Alzheimer’s disease or vascular dementia, alone or in combination. In clinical practice, non-drug interventions should be tried firstw17 especially when symptoms are neither causing distress nor placing a person at risk to themselves or others.16 Therapeutic interventions that are tailored to the individual and establish a good rapport with the person with dementia and their carers are essential. Continuity of clinical care may also be important because it permits a complex appreciation of individuals. For example, a person’s own awareness of changes in their cognitive function is associated with better treatment outcomes after cognitive rehabilitation, but awareness can be difficult to assess as individuals with Alzheimer’s disease may deny problems in one context but report awareness of them in another.w18 General practitioners are well placed to have this understanding of their patients, and collaboration between specialists and general practitioners in the care of people with Alzheimer’s disease is essential. Cochrane reviews show that cholinesterase inhibitors have a moderate but worthwhile symptom modifying effect in a substantial minority of people with Alzheimer’s disease and are generally well tolerated.w20 The difference between active treatment and placebo on core measures of cognitive function is about three points on a 70 point scale over six months. This equates approximately to the decline expected over the same period. About 10% more people taking the active drug responded compared with those taking the placebo. Core efficacy is essentially the same for the drugs, with choice determined on the basis of familiarity by the clinician, “once daily” dosing (all three cholinesterase inhibitors are available in patch form), and ability to manipulate the dose (rivastigmine). Since April 2004 all English primary care trusts have been required by the national service framework for older people (2001) to have a shared-care protocol in place for prescribing and monitoring use of cholinesterase inhibitors in general practice and specialist settings. Memantine is a glutamatergic partial antagonist that some trials have found effective in people with more severe dementia, but its use in the UK National Health Service is restricted to those involved in clinical trials of this drug (see NICE’s technology appraisal at www.nice.org.uk/TA111). How can behavioural and psychological difficulties be managed? The sequence of events is often more important than phenomenology in determining causation. For example, did a change happen after an alteration in medication, moving rooms in a nursing home, or even a change in staffing? The management of behavioural disturbance is closely linked to the underlying cause and is generally independent of the type of dementia. Although antipsychotic drugs consistently reduce agitated behaviour, concerns have been expressed recently over the safety of both the older (such as haloperidol) and second generation (such as risperidone, olanzapine, and quetiapine) antipsychotics19 in terms of an increased risk of stroke and mortality20 and a detrimental effect on cognition.w22 Antipsychotic drugs have long been used to treat problem behaviours such as sexual disinhibition, wandering (often associated with agitation), swearing, and shouting. Other sedatives may be effective, as may β blockers, benzodiazepines, and carbamazepine.w23 The evidence for efficacy is patchy, with few well described methodologically sound randomised controlled trials. Second generation antipsychotic drugs have been more extensively studied in prospective randomised controlled trials than the older tricyclics, but evidence has accumulated to show they have the same side effect profile and increased mortality rate as first generation antipsychotics, and both have been shown to be associated with more rapid cognitive decline.22 Although the second generation antipsychotics reduce agitation, probably independently of a sedative effect, they seem to have little specific benefit on psychosis. Concerns over the safety of second generation antipsychotics led to a warning about their use for people with agitation in dementia, but their licence still allows for the treatment of psychosis. The NICE dementia guidelines recommend that if drug treatment is used, it should be at the lowest effective dose. The guidelines advise caution if using drugs to control behaviour, particularly if the person has been restrained, because of the risks of loss of consciousness instead of sedation, over-sedation with loss of alertness, and damage to the relationship between the person with dementia, their carers, and the care team. Is prevention of Alzheimer’s disease possible? Evidence is growing that some interventions may delay the onset of Alzheimer’s disease. Predicting the onset of dementia is possible (table⇓). Prevention is a complex area: interventions with single agents (such as antihypertensive drugs or statins) are unlikely to result in a large scale reduction because many risk factors are involved and intervention studies would therefore be complex to design and execute. Whether interventions affect the core biological mechanisms of Alzheimer’s disease or are mediated through reduction of vascular risk factors is unclear. For example, statins not only reduce cholesterol but also have, for example, antithrombotic and anti-inflammatory actions. Ageing and family history (genetic) factors are traditionally regarded as non-modifiable risk factors, but that view may be challenged by the avoidance of the effects of chronological ageing by lifestyle interventions and perhaps ultimately by gene therapy. Public interest in the possibility of preventing Alzheimer’s disease is high (box 4). The ageing of populations in industrialised and developing countries makes Alzheimer’s disease everybody’s business. It requires all practitioners working with older patients to understand the insidious onset, main features, and impact of dementia and to be aware of the range of responses available. We searched Medline and Pubmed from 2006 to September 2008, previous work having been summarised in the joint dementia guideline published by NICE and the Social Care Institute for Excellence in 2006. We searched the Cochrane database (2008 version) for randomised controlled trials for drug treatment and psychosocial interventions and used our own knowledge of the literature and selected authoritative reviews to supplement these sources. Burns A, O’Brien J. Clinical practice with anti-dementia drugs: a consensus statement from British Association for Psychopharmacology. J Psychopharmacol 2006;20:732-55. Alzheimer’s Society. Dementia in the community: management strategies for primary care. London: AS, 2006. Both authors are associate directors of the Dementia and Neurodegenerative Diseases Research Network (DeNDRoN). Contributors: Both authors contributed equally to the preparation of this manuscript. AB is the guarantor of the paper. Competing interests: AB is editor in chief of the International Journal of Geriatric Psychiatry and receives research funding and consultancy fees from pharmaceutical companies involved in the manufacture and marketing of drugs for Alzheimer’s disease including Eisai, Pfizer, Shire, Novartis, Janssen-Cilag, Lundbeck, and Wyeth. SI was a member of the guidelines development group (2004-6) for the joint NICE and Social Care Institute for Excellence guidelines and of the Dementia Strategy External Reference Group (2008). Burns A, Jacoby R, Levy R. Psychiatric phenomena in Alzheimer’s disease. Br J Psychiatry1990;157:72-94. Feldman H, Woodward M. The staging and assessment of moderate to severe Alzheimer disease. Neurology2005;65:S10-7. Snowdon DA, Greiner LH, Mortimer JA, Riley KP, Greiner PA, Markesbery WR. Brain infarction and the clinical expression of Alzheimer disease. The Nun Study. JAMA1997;277:813-7. Matthews FE, McKeith I, Bond J, Brayne C; MRC CFAS. Reaching the population with dementia drugs: what are the challenges? Int J Geriatr Psychiatry2007;7:627-31. Brayne C. The elephant in the room—healthy brains in later life, epidemiology and public health. Nat Rev Neurosci2007;8:233-9. Nestor PJ, Scheltens P, Hodges JR. Advances in the early detection of Alzheimer’s disease. Nat Rev Neurosci2004;5:S34-41. Spaan PE, Raaijmakers JG, Jonker C. Alzheimers’s disease versus normal ageing: a review of the efficiency of clinical and experimental memory measures. J Clin Exp Neuropsychol2003;25:216-33. Leroi I, Lyketsos C. Neuropsychiatric aspects of dementia. In: Burns A, O’Brien J, Ames D, eds. Dementia. 3rd ed. London:Hodder Arnold, 2005:55-64. Dubois. Research criteria for the diagnosis of Alzheimer’s disease: revising the NINCDS–ADRDA criteria. Lancet2007;6:734-46. Chui HC, Victoroff JI, Margolin D, Jagust W, Shankle R, Katzman R. Criteria for the diagnosis of ischemic vascular dementia proposed by the State of California Alzheimer’s Disease Diagnostic and Treatment Centers. Neurology1992;42:473-80. Román GC, Tatemichi TK, Erkinjuntti T, Cummings JL, Masdeu JC, Garcia JH, et al. Vascular dementia: diagnostic criteria for research studies: report of the NINDS-AIREN International Workshop. Neurology1993;43:250-60. Burns A, Byrne J, Ballard C, Holmes C. Sensory stimulation in dementia: an effective option for managing behavioural problems. BMJ2002;325:1312-3. Burns A, O’Brien J. Clinical practice with anti-dementia drugs: a consensus statement from British Association for Psychopharmacology. J Psychopharmacol2006;20:732-55. Waldemar G, Phung KTT, Burns A, Georges J, Hansen FR, Iliffe S, et al. Access to diagnostic evaluation and treatment for dementia in Europe. Int J Geriatr Psychiatry2007;22:47-54. Wang PS, Schneeweiss S, Avorn J, Fischer MA, Mogun H, Solomon DH, et al. Risk of death in elderly users of conventional vs. atypical antipsychotic medications. N Engl J Med2005;353:2335-41. O’Brien J. Antipsychotics for people with dementia. BMJ2008;337:a602. Callahan C, Boustani M, Unverzagt F, Austrom M, Damush T, Perkins A, et al. Effectiveness of collaborative care for older adults with Alzheimer’s disease in primary care: a randomized controlled trial. JAMA2006;295:2148-57.